The Microplane has changed my life. (Please imagine inspirational music playing while you look at the above image.) Gone is the day of awkward cheese shredding. 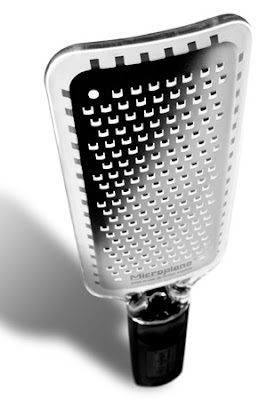 The microplane fits in one hand and allows you to grate cheese or zest lemons over your favorite dish. It's easy. It's neat. I love it. This is especially useful for the Arugula and Pecorino salad I posted last month. I just bought mine for $15 bucks at Sur la Table.